Why choose Nuffield Health Oxford, The Manor Hospital for your hip revision? Our Oxford Hospital is one of the most modern and technologically advanced private hospitals in the UK. Recently we have invested heavily in state-of-the-art technology scanners and equipment to support the wide range of specialist services we offer. One area we have invested in is orthopaedics, (which includes bones, joints, ligaments, tendons, muscles, nerves), and as a result have upgraded our hospital to a centre of excellence. Our consultants and dedicated nursing staff take great pride in providing the finest private medical care for all our patients in a clean and comfortable hospital setting. What is hip revision surgery? 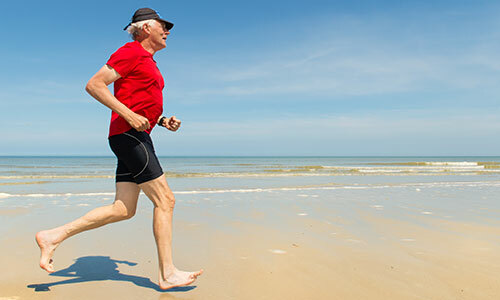 Hip revision surgery is a surgical procedure to take out your old, worn out hip replacement to put in a new one. Fracture of the thighbone (Femur). To aid in your rehabilitation after surgery, you will be eligible for our Recovery Plus programme at your local Nuffield Health Fitness & Wellbeing Gym. What happens during hip revision surgery? During your operation your surgeon will remove your old hip prothesis and any cement that might have been used to hold it in place. He will replace your old prosthesis with new components. Your surgeon’s choice of prosthesis will be based on several factors such as your age, your level of activity and your current condition. Both cemented and uncemented replacements are used. If you have concerns be sure and ask your surgeon about his prosthesis choice. One of our on-site physiotherapists will give you some exercises to help get your new hip moving. These are important to help you make a good recovery. You may be using crutches or a walker. When you are able to walk up and down stairs, you can go home. You won’t be able to drive, so you will need someone to come and take you home from the hospital, once you have been discharged. Keep wearing your support stockings - you may have to do so for four to six weeks. If you have any questions or concerns about your restrictions be sure and ask a member of Nuffield Health Oxford Hospital's Healthcare Team or Physiotherapists. What are the risks involved with a hip revision? Most people make a good recovery and return to normal activities following hip revision. However as with any surgery there can be complications. Hips and knees are designed to last a lifetime but injury, accidents and osteoarthritis can leave your joints worn out and very painful. Our experts in nutrition, orthopaedics and exercise share their tips for looking after your joints. Keep your hips and knees strong with these joint-protecting exercises from Senior Wellbeing Personal Trainer, Haydn Ward.